Alano Club of St. Joseph, Mo. Inc.
Fried Chicken provided. Please bring a side dish or desert. 12:00 PM – AA – John A. 1:00 PM – NA – Felecia W.
2:00 PM – GA – MaryAnn S.
3:00 PM – Alanon – Tina K.
Dinner will be at 4:00 PM; Auction will end and be announced at 6:00 PM. More items will be available. The Alano club has supported the Recovery community by providing meeting spaces to groups for many years. Due to the increased costs, we are having this fundraiser to keep the doors open and the lights on. For more information and directions: Please contact Kirby at 816-593-2173 (Home) or 816-344-9157 (Cell). 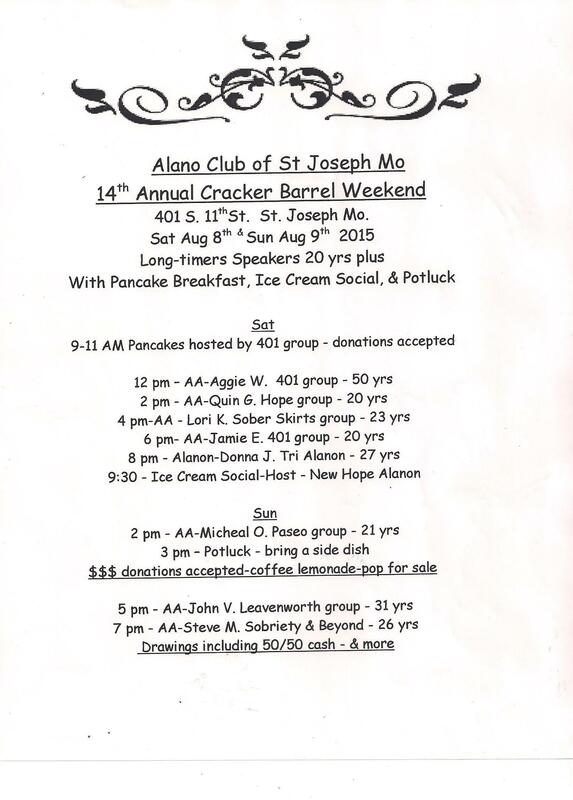 The Alano club of St. Joseph is hosting the 15th annual Cracker Barrel weekend. $$$ donations accepted – coffee and lemonade, pop for sale. A& M Heating and Cooling came to our rescue. On Wednesday, about 3:30 PM, we heard a loud screeching sound – as if someone was dragging a metal desk across the floor. Then silence. After a few minutes we thought we smelled something like an electrical fire. There were three people, Gina, Doc, and Gary C., all of questionable repute. They all agreed on the odor. They searched the building and could find nothing. Because we treasure the building and choosing to error on the side of caution, the fire department was called and asked simply to send someone to help us locate the problem. No need for big trucks and sirens. One fire unit was sent with two men, one was Jeremy Howery. They were extraordinarily professional and pleasant. We finally isolated the problem to the kitchen area furnace. The blower would not come on. On Friday Gary C. and Brian L. tackled the furnace. Neither of these men is a furnace aficionado- so several cups of coffee were required in the planning phase of the maintenance project. After about an hour of actual work the blower squirrel cage fan and motor were removed. This was when we were able to actually see what had happened. One or more of the blades came loose and destroyed the whole unit in a high RPM clash of metal against metal. The photo at the left was taken at A&M after the A&M technician Dale had removed it from the cage. We actually took the whole assembly to Ragdon – that has been our go-to place with furnace motor problems in the past. He referred us on to a furnace place on north third – nope, they did not have those parts, but they sent us to a place on north fourth. No luck there but they sent us to A& M on south 4th street. We were graciously accepted before they even knew who we represented. They could readily see that we were not professionals and had little knowledge of what we were asking. No matter – they quickly began looking around their shop for a replacement fan. We learned today that these fans are not kept as a part of regular inventory at Heating and Cooling companies – but A&M had some parts from previous ventures. Dale found one that almost perfectly fit our need. While Dale was working I explained that the furnace was at the Alano Club of St. Joseph. The office lady, whose name I sadly cannot remember, Lori I think, asked a few questions about our operation, checked with the owner Mike Anderson, and informed us that the cost of the fan would be ten dollars, including installation on the motor and in the cage. When it was time to pay I found I had only seven dollars cash on me so I offered a credit card. “No,” she said, “Seven dollars is enough”. She also informed me that she had been talking with the owner, Mike Anderson, about donating two free furnace checks a year (an eighty dollar value). These folks are great people to work with. I just cannot say enough about them – the Alano Club has been around for sixty seven years because of people like this. We are a public health organization working to make St. Joseph and the surrounding area a better place for all. We host about 36 sanctioned meetings every week and have nearly 2,000 individual visits to our building every month. This work happens through the generosity of people like Mike Anderson of A&M Heating and Cooling. With a repaired fan in tow, Brian and Gary returned to Alano where more coffee was required to plan the re-installation of the fan and motor. After a couple of hours the work was done. People were showing up for the 5:30 AA and Al-Anon meetings and the building was cozy warm. We live in a great community of people helping each other – each of us contributing in our own way to the public health. This has been a great day and for that I am forever grateful. The people who receive help at Alano are forever grateful. 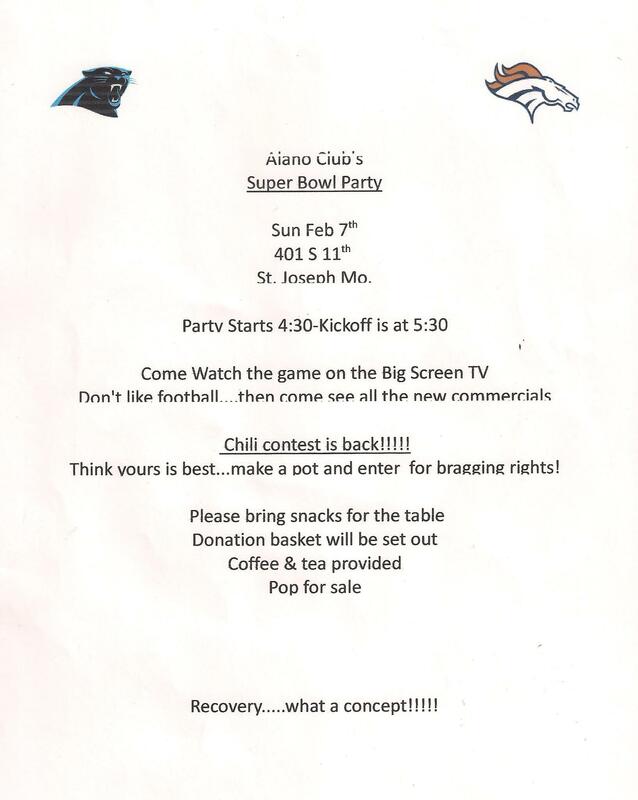 The Alano Club of St. Joseph is again hosting a Super Bowl Party – open to the public. Party starts at 4:30 PM. Don’t like football… then come see all the new commercials. The Chili contest is back. Think yours is best… make a pot and enter for bragging rights! Please bring snacks for the table. Donation basket will be set out. Recovery — What a concept!!! First time ever speaker’s meeting representing four 12 Step Programs. Speakers begin at 6:00, each speaking for 20 minutes. It is common knowledge that AA (and therefore the entire Twelve Step movement) had its birth within and evangelical Christian movement known as the Oxford Group. AA separated itself from the Oxford Group prior to the publication of the Big Book. The Big Book contains some religious language, but only mentions Jesus once, and then only in passing. This has left historians and AA members divided over some important questions. Just how Christian was early AA? Who is the God of the Big Book? Is this the Christian God, or can we really take this to mean a God of our own understanding? The Alano Club is hosting a ‘movie night’. The movie “The Anonymous People” will be shown on a 32 inch flat screen TV. Anyone interested is invited. The Unity Committee of Alano is hosting the event – there will likely be some popcorn floating around. WHEN: Saturday, November 15, 2014, 9:30 PM (Immediately following the 8:00 Open Speakers Meeting. WHERE: The Alano Club of St. Joseph. THE ANONYMOUS PEOPLE is a feature documentary film about the 23.5 million Americans living in long-term recovery from addiction to alcohol and other drugs. Deeply entrenched social stigma and discrimination have kept recovery voices silent and faces hidden for decades. The vacuum created by this silence has been filled by sensational mass media depictions of people in active addiction that continue to perpetuate a lurid public fascination with the dysfunctional side of what is a preventable and treatable health condition. Just like women with breast cancer, or people with HIV/AIDS, courageous addiction recovery advocates are starting to come out of the shadows to tell their true stories. The moving story of The Anonymous People is told through the faces and voices of the leaders, volunteers, corporate executives, and celebrities who are laying it all on the line to save the lives of others just like them. This passionate new public recovery movement is fueling a changing conversation that aims to transform public opinion, and finally shift problematic policy toward lasting recovery solutions. At present St. Joseph has three men’s Oxford houses and no women’s house. 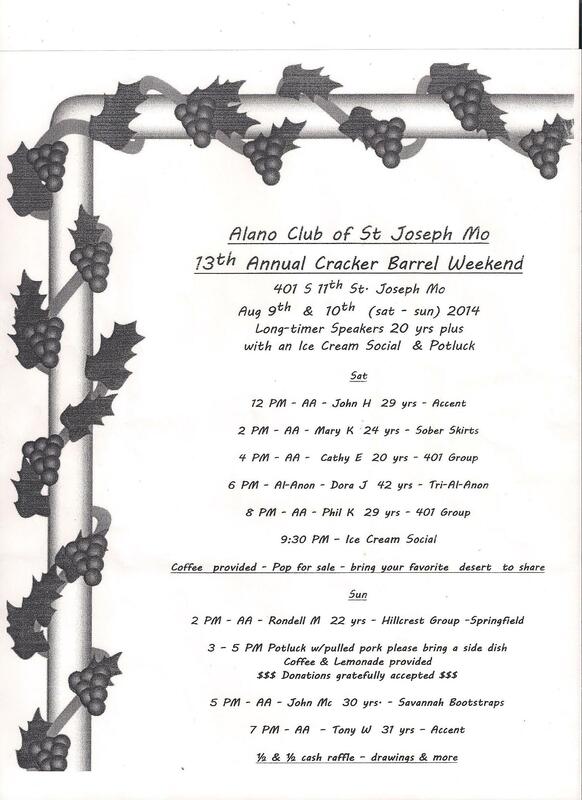 Cracker Barrel – August 9-10, 2014. Alano Club 401 S 11th.